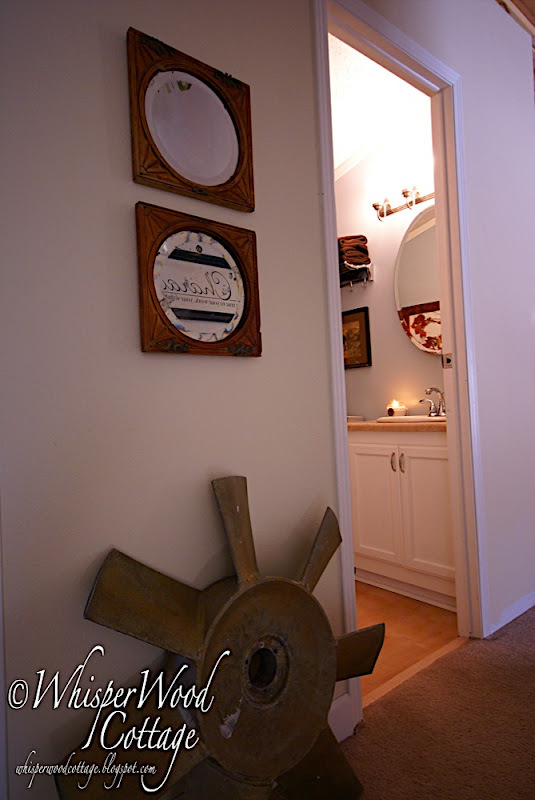 ere is America's choice: the WhisperWood Cottage Guest Bath makeover. You were able to see past this contestant's rough exterior and see the true potential within. (Did you miss the contestant auditions? And the judge's comments?) Now, mind you, this bath comes from humble beginnings and still leads a modest lifestyle. 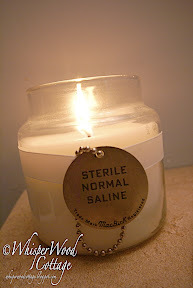 There are no high-end materials or any extra-creative ideas...just a few special tweaks to make it not so...um...icky? For the next four photos, move your mouse over the image to see the before and after! That's it! While it's nothing too fancy, out of the ordinary, or award-winning in any way, it is definitely a step up from what we started with. Don't you agree? I loved that post Amy! You are so clever, to get the picture to change when you move the mouse over it! Cool!!! Girl, you are good! Your bathroom is loverly! I love it! 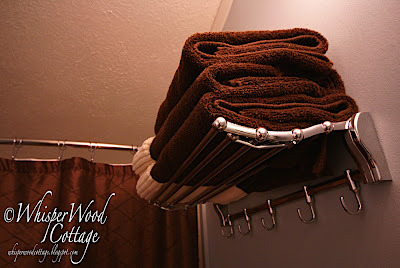 Where did you find the great towel rack above the toilet. Looks good, sweets. I love the before and after mouse thingy. Better than side by side photos! P.S. I still want to see the man in a tool belt! The wall color is just wonderful! Truly a fantastic makeover. Really inspiring ! wonderful blog. Lovely makeover. I really like the coatrack with the towels. Showed it to my Love, working on letting the idea grow on him. 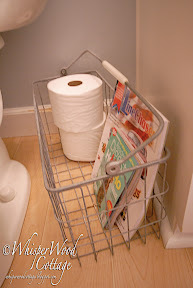 We have an ittybitty bathroom and all decorative storage ideas are more than welcome. stunning results - great, great!! So pulled together! p.s. just saw your barn door on houzz tossed & found link - awesome! 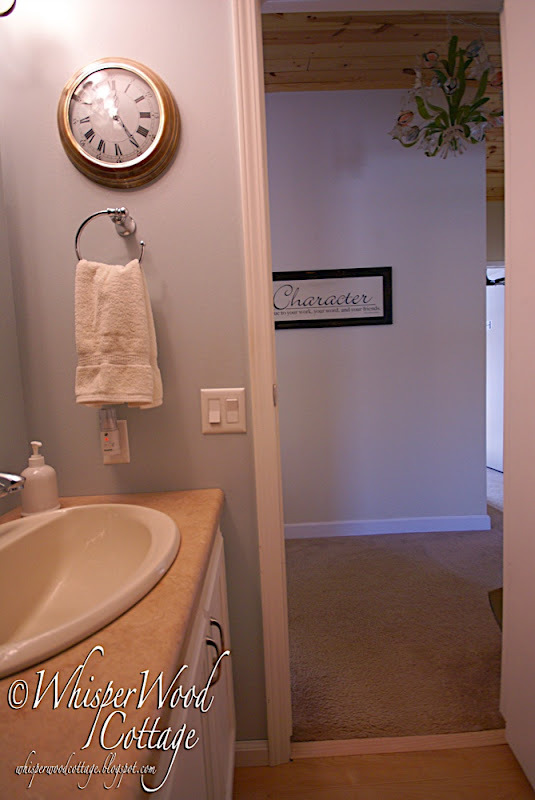 I love the picture on the bathroom room and that chandelier in the hallway! Is it old or a replica?? Hi Amy. I just stumbled across your post and am so glad I did. What amazing things you have done. 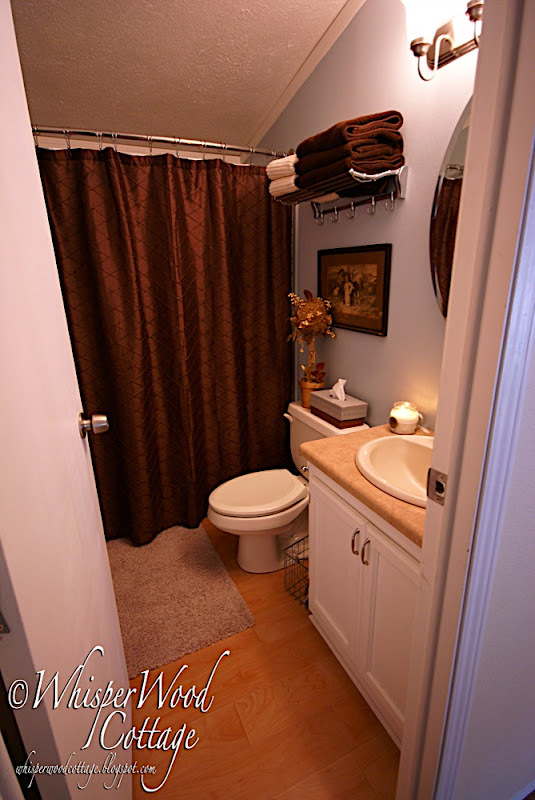 It's so hard to find mobile home makeovers and I love to see them. Especially one like yours where you'd never even know it was a mobile home. Great job both of you have done. Absolutely love the doors. 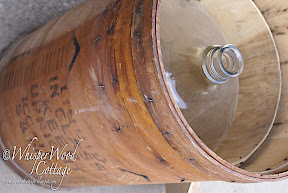 The rustic touches are perfect and your husbands lamp making skills are great. I love all the creative things you've done. Just fabulous. I'll be following, you couldn't stop me now if you wanted to. Ha-ha. Lovely! Thanks for sharing the pictures - love the coat rack idea...you're so smart! Stop by.... and great job! Besides being super impressed with the makeover I am impressed with the computer technology! How neat to see the change with the move of the mouse! I love both looks. Great job! Don't know which I enjoyed most your makeover or the computer magic. You need to share your computer skills with the rest of us. 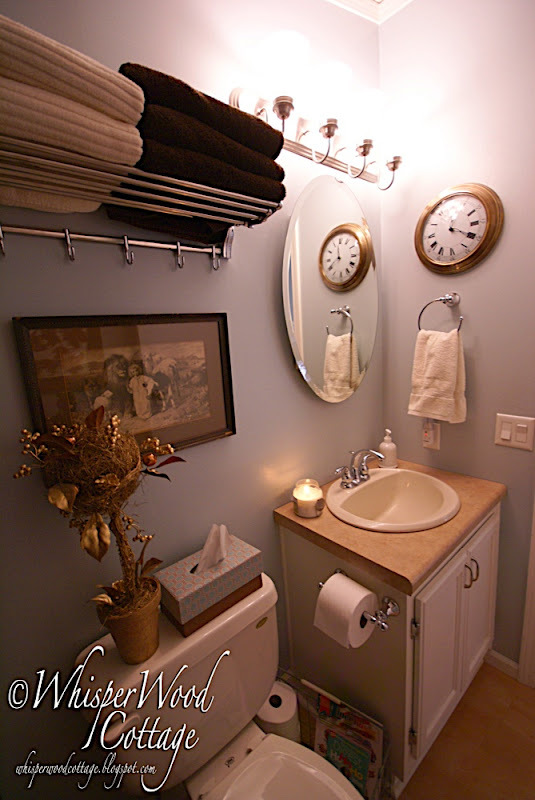 The bathroom looks great and your decorating talent shows in you accessories. WOW! Great job!! I love your "summer" look too!! What a change! And I love that this is a real bathroom. It looks great. How did I miss this on Friday? And I even voted for the bathroom! Well, once again, I Love It! Can you share the wall color? Looks gorgeous! Love the chocolate brown! Your colors are very pretty and I like the way you can make seasonal changes to it. 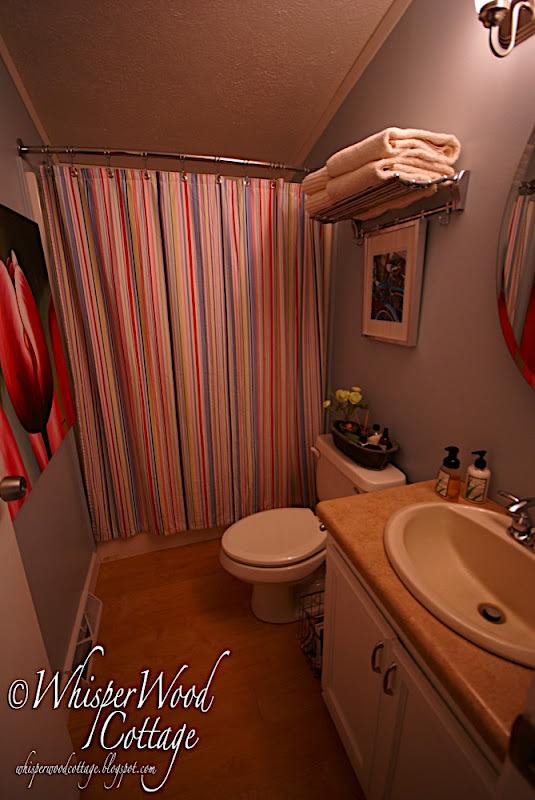 Our bathroom is even smaller, if you can imagine, and it's nice to see how you used the space. That is a fabulous transformation! I love it now. So pretty. The colors are amazing. I love that clock you have too. Looks great! It very nice! Thanks for the inspiration. Very pretty! I love the calm, serene colors you used. Beautiful! It looks absolutely amazing. I love all the little special touches that make it WOW!! Thanks for sharing. An AMAZING transformation! Even if it had JUST been the paint, it will would have been a major change. But I love everything you did! Great job. I love it! I just about choked when I read that indeed you have the same "fancy toilet roll holder" as my self..... Beautiful work, and your photos are stunning! smiles.